Palestinian police in Gaza have seized a door with a painting on it by British graffiti artist Banksy after its original owner said he had been tricked into selling it cheap for just $175. 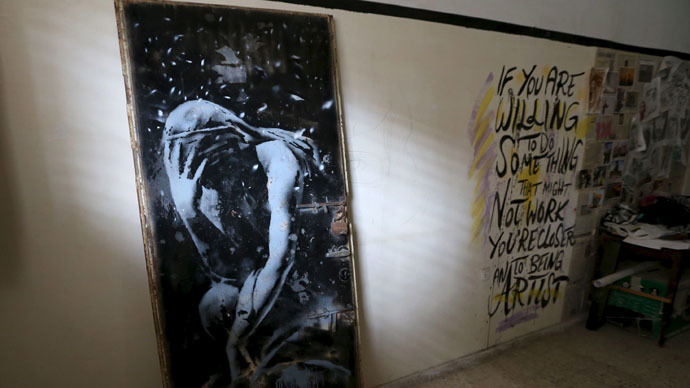 Banksy, a reclusive British street artist from Bristol, visited Gaza this year and is known to have authored several paintings on buildings, some of them in ruins. The artist visited Gaza in February presumably to draw attention to the conflict between Israel and the Palestinians and the humanitarian catastrophe for the latter. He also filmed an undercover documentary depicting the real life of ordinary Palestinians. It’s called ‘Make this the year You discover a new destination’, in a satire of the travel advert format. The work in question, a goddess holding her head in her hand, had been spray painted on the iron and brick doorway of Rabea Dardouna’s ruined home, whichhad been destroyed in Israel’s war on Gaza last summer. Dardouna then sold the door to the artist Belal Khaled for just 700 shekels (about $175). Banksy paintings normally sell for more than $500,000. Thus, a mural on a shop in London sold in 2013 at a private auction for $1.1 million. The door was seized from Khaled by police following a court order after a complaint by Dardouna that he had been ripped off, police spokesman Ayman Batniji told AP. “I will seek to return the door to its true owner, Rabea Dardouna. My client was cheated,” Mohammed Rihan, Dardouna’s lawyer, told Reuters. Khaled said last week he wanted to protect the Banksy mural from neglect and that he had always wanted to own something from the renowned street artist. The Gaza conflict erupted in the summer of 2014 after the abduction and murder of three Israeli teenagers, which Israel blamed on Hamas. In retaliation Israel launched airstrikes, which saw Hamas fire rockets back into Israel. The ensuing war killed more than 2,000 Palestinians and left 539 Palestinian children dead and almost 3,000 injured. 67 Israeli soldiers and a handful of civilians were killed, according to the UN.